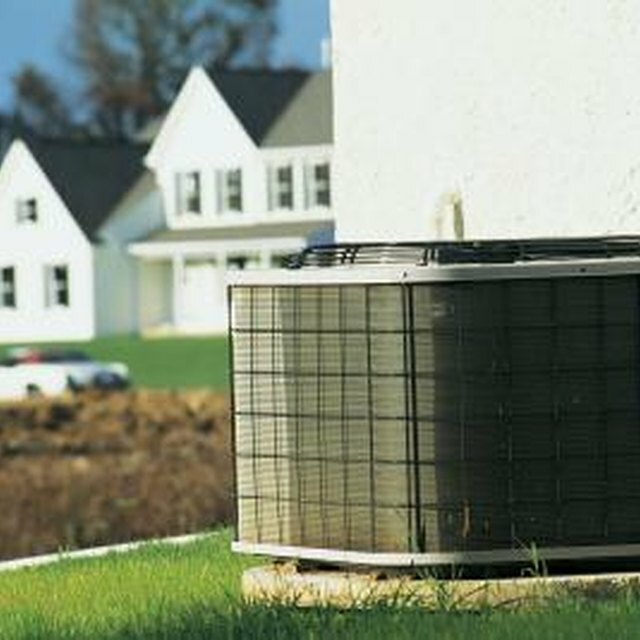 Naturalaire is a brand of air filter for home heating and cooling systems. The filter fits inside the blower compartment on the furnace, which is a stainless steel box connected to the ductwork. Naturalaire filters come in a variety of sizes to fit different furnace models, so it's important to check the dimensions of the old filter before installing a new one. Furnace manufacturers typically recommend changing the filter once a month to catch dust particles that would otherwise blow into your home. Shut off power to the furnace. A breaker switch is typically built into the side of the furnace, or you can cut off the unit at the household circuit breaker. Open the blower compartment on the side of the furnace, using a screwdriver to turn the screw latches that release the vented cover. On some models the screws may not come out completely. Instead, twist each screw half a turn counterclockwise to disengage the latches and open the cover. Pull out the old filter and check the printing around the frame for the dimensions, for example, "12 x 24" If the dimensions are not printed on the old filter, measure the part with a tape measure and write down the length and width in inches to purchase the correct Naturalaire replacement. Insert the new Naturalaire filter into the compartment with the arrow on the edge of the filter facing inward toward the blower. Close the cover and turn the screw latches to hold the cover in place. Restore power to the furnace.